Since hearing of her beloved husband’s death, Morwenna Nash has been mired in grief. 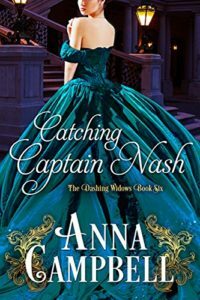 After five bleak years without him, she must summon every ounce of courage and determination to become a Dashing Widow and rejoin the social whirl. She owes it to her young daughter to break free of old sorrow and find a new purpose in life, even if that means accepting a loveless marriage. It’s a miracle when Robert returns from the grave, and despite the awkward circumstances of his arrival, she’s overjoyed that her husband has come back to her at last. But after years of suffering, he’s not the handsome, laughing charmer she remembers. Instead he’s a grim shadow of his former dashing self. He can’t hide how much he still wants her—but does passion equal love? Buy from Amazon, Smashwords, Kobo, iTunes, and Barnes and Noble. There was a tall screen set up near the fire. Morwenna had never imagined feeling shy with the man who had shown her that her body was made for pleasure and love. But right now, nothing short of a pistol to the head could make her undress in front of Robert. Like the frightened mouse she so despised, Morwenna snatched up the nightdress spread over the bed and scuttled behind the screen. There she collapsed on a padded stool and stared blindly into space. It took her a shaming amount of time to find the heart to remove slippers and stockings. She even managed to take off her drawers and petticoats. Her skin itched with awareness, although the room outside was so quiet that she could almost believe she was alone. But she was vividly conscious that her husband could hear every rustle from behind the screen. “What is it?” a deep voice inquired from much closer than where she’d left him. He’d done this for her before, of course. In those heady, too brief days after their wedding. When she’d imagined a lifetime as Robert Nash’s wife. But still she jumped when his fingers brushed her nape. A sizzle of heat rippled down her spine, and her stomach lurched. He began to tug at the fastenings with a clumsiness she didn’t remember, and she realized that he was trembling again. She was so preternaturally aware of his closeness, she felt every faint hesitation in his fingers. When it seemed to take him forever to finish, the breath snagged in her throat. She was seeing colored lights in front of her eyes before she remembered to take another breath. Then she realized Robert was holding his breath, too. That salty smell was rich in her nostrils, mingled with the underlying spice that was his alone. She’d never been so conscious of his height and power, even when she’d come to his bed as a virgin bride. After about a hundred years, he reached her waist and briefly rested his hands on her hips. The urgency to feel him invade her body became overwhelming. She wasn’t sure what she thought of this man who returned to her from his watery grave. But her body gave no heed to her mind’s havering. Her body only knew that after a long famine, pleasure beckoned at last. After a mere second, he released her. She made herself straighten, preparatory to stepping away, when she felt a tug on the laces of her stays. A soft whoosh of breath escaped her. This was like torture. This time his touch was sure, and she soon felt her corset sag. She reached up to clutch her bodice, before it slipped down to disgrace modesty. Although modesty was surely out of place when she stood before her husband. For another bristling second, he remained behind her. Close enough to touch her. But not touching her. She felt like she hung suspended over a precipice. Morwenna quivered as she imagined those large hands, more disturbing than before with their scars and calluses, hauling her back into his body. Starting to sway, she bit her lip and shut her eyes. The crack in his voice hinted that unlacing her had been as fraught for him as for her. But that knowledge was more threat than reassurance. “Th-thank you,” she forced out. She turned to look at him, but he’d left her alone behind the screen. Had he always moved so quietly? She shivered again. She had no idea what Robert was thinking, beyond the fact that despite his attempts to hide it, he hadn’t stopped wanting her. Oh, dear. She was so keyed up, she was likely to snap into pieces before the night was over. In a rush, she flung off her clothes and had a quick wash, hating the way the touch of her hand made her imagine other, harder hands stroking her skin. Once she’d pulled her filmy nightdress over her head, she loitered far too long behind the screen. She felt…bashful. Silly as it was to admit, when she’d been married for six years. A woman of twenty-six with a child shouldn’t feel like an untried girl. Still, she required a mammoth amount of will to step into the open. “Oh,” she said, struck as inarticulate as Robert had been downstairs. He was sitting up in the bed, bare-chested, with the blankets pulled to his waist. Was he naked? With another of those dizzying lurches in her stomach, she supposed he must be. “Come to bed,” he said softly, and her blush rose again.